G450 compact, lightweight and easy handling 4 gas detector measure H2S, CO, O2 and combustibles in ambient air continuously. The device allows intuitive handling with only three soft keys because of the simple menu drive. A large full graphic relevant data. It has the extremely loud audible alarm and bright moving all-round LEDs. Depending on alarm status, the display changes its color from green to orange or red. TLV, TWA and STEL values are also monitored. A vibrating alarm is available optionally. An electrical HD pump with own power supply is attachable. In case of insufficient flow caused by blocked or snapped tubing flow alarm is triggered. 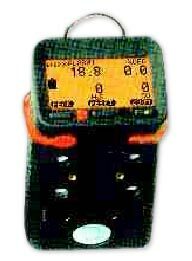 The optional loop data logger records gas concentrations and alarms over a period of 50 hours. These data can be transferred to PC for visualization and evaluation. The display can be turned 180Âº by just pushing a button. This allows an easy reading without contortion even if the detector is carried at the belt. Detection Principles Electrochemical, Catalytic combustion sensor, Thermal conductivity, Infra-red sensor.